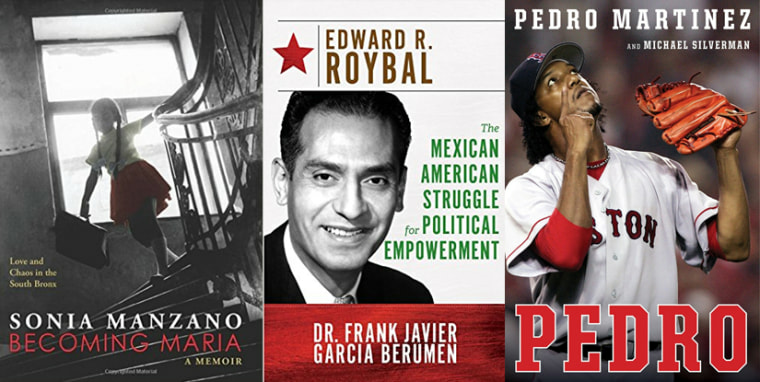 Left to right: "Becoming Maria: Love and Chaos in the South Bronx" by Sonia Sanzano, "The Mexican American Struggle for Political Empowerment" by Edward R. Royal, and "Pedro" by Pedro Martinez. Outstanding books in the fields of fiction and non-fiction, children's literature and poetry are just a few of the dozens of genres showcased at the 18th annual International Latino Authors Awards. Authors and publishers gathered for one of the largest cultural awards honoring Latinos at California State University Dominguez Hills outside of Los Angeles on Thursday. Over 2,000 gathered to honor colleagues in a variety of genres, including Children and Youth Adults, Biography, History, Politics & Current Affairs, Cookbooks, Travel, Science Fiction, among others, in English, Spanish and Portuguese. The winner for best Latino-themed fiction book was Make Your Home Among Strangers, by Jennine Capó Crucet, a novel about a young Cuban-American woman torn between her humble immigrant family and life in an elite American college. Sesame Street star Sonia Manzano's “Becoming María: Love and Chaos in the South Bronx” won for Best Young Adult Nonfiction Book. “Pedro” by former MLB star pitcher Pedro Martínez took home first place in the Best Sports/Recreation Book. "Cuba, Adiós: A Young Man's Journey to Freedom" by Lorenzo Pablo Martínez won first place under biography and "Grounds for Dreaming: Mexican-Americans, Mexican Immigrants and the California Farmworker Movement" won for Best History Book. Awardees represented a cross section of the nation and 17 other countries, and more than 200 judges participated in the selection process. The Best Latino Focused Children's Picture Book went to The Sock Thief by Ana Crespo in the bilingual category and to "Maybe Something Beautiful: How Art Transformed a Neighborhood" in the English-language category. Here is a list of all the nominees. The Awards are produced by Latino Literacy Now, an organization co-founded in 1996 by actor Edward James Olmos to improve literacy throughout the Latino community, and sponsors include REFORMA: the National Association to Promote Library and Information Services to Latinos, an affiliate of the American Library Association that promotes library collections which include Spanish-language and Latino-themed materials.